Be sure to check out the #ICAR_2016 Twitter stream to get all the news with contributions from several people. @GARNetweets and I are mostly attending different concurrent sessions, so be sure to see his stream for additional talks and links. Also, the conference program is here. I should point out that once again the conference Wifi is not adequate for the needs of the attendees – I hope that the organizers of next year’s conference can recognize the importance of this concern. The first full day of ICAR2016 kicked off with a brilliant Keynote talk by Hiroo Fukuda (University of Tokyo) on the signalling mechanisms involved in the differentiation of xylem and phloem from the vascular cadmium. Fukuda has been working on this question for a long time, and learned a lot from his system of culturing Zinnia mesophyll cells, in which xylem forms from differentiated cells by transdifferentiation. His group is now using Arabidopsis for the study of xylem and now phloem differentiation, and it’s great work. Here are a couple of links go get you started; The TDIF signaling network (Curr Opin Plant Biol 2015), Functional mechanism of bHLH complexes during early vascular development (Curr Opin Plant Biol 2016) and A novel system for xylem differentiation in Arabidopsis thaliana (Molecular Plant, 2014). Don’t miss the group’s most recent paper, just out in Plant Cell, Vascular cell induction culture system using Arabidopsis leaves (VISUAL) reveals the sequential differentiation of sieve-element like cells. The second morning Keynote was by Youngsook Lee (POSTECH Korea) who spoke on plant ABC transporters. 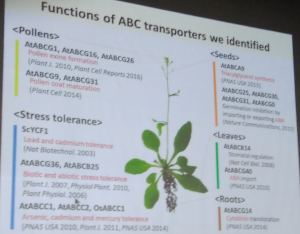 She pointed out that plants have relatively more ABC transporters as compared to animals or yeast (by contrast, animals have many more fast-responding ion channels). She observed that some members of this highly proliferated ABC transporter gene family export hydrophobic compounds, which may have contributed to the ability of plants to adapt to the dry environment of life on land (by coating surfaces with hydrophobic materials – see Choi et al Plant Cell 2014 26: 310). Furthermore, these transporters move wastes and secondary transporters onto the vacuole. She then went on to describe her group’s work on ABCG transporters (for a really nice review see Hwang et al, 2016), and the coordination of root and shot growth via cytokinin transport: see Ko et al PNAS 2014. Next, she described the role of ABC transporters on arsenic tolerance: see Song and Park PNAS 2010 and Song 2014. Next, she discussed their role in ABA transport: see Kang et al PNAS 2010 and Kang and Lim et al Nature Communications, 2015, including a very cool experiment where dissected embryos were cultured on wildtype or mutant seed coat/ endosperm to examine the role of transporters in the movement of ABA from endosperm to embryo (wow). Finally, she described unpublished work on the role of ABCG transporters on the secretion of defense compounds such as camalexin. After coffee we split into two concurrent sessions. Update: Garaint Parry (@GARNetweets) just sent me his notes for this section, included here. Masaaki described work that primarily used zeocin to induce double strand breaks in Arabidopsis, with the work mostly focussing on the root meristem. He discussed how a range of hormones interact with the DNA damage repair machinery: BR is responsible for QC cell division, auxin acts as a block on stem cell death following DNA damage whilst cytokinin induces DNA polyploidization that leads to irreversible cell differentiation in the elongation zone. Annika provided an update from the Bergman lab (http://web.stanford.edu/group/bergmann/cgi-bin/bergmannlab/people) where they have discovered another layer of complexity in the development of stomata. She showed that the CYCD7 is tightly regulated by both MUTE and FAMA and that the RBR-CDKa signalling module, which has been well characterised in the root, is also active in guard cell precursors. Importantly she stressed that the situation in this tissue is different given the terminal differentiation that occurs following the final guard cell division. Adrienne Roeder (Cornell University USA) “Fluctuations of the transcription factor ATML1 control the pattern of endoreduplication versus mitosis in the Arabidopsis sepal epidermis. Adrienne’s lab (http://roeder.wicmb.cornell.edu/) researches the factors that lead to the differentiation of giant cells in Arabidopsis sepals. In this outstanding presentation she extended this analysis by amalgamating ATML1 expression data with predictive modelling. She demonstrated that a certain level of ATML1 will lead the cell toward giant cell differentiation. Importantly this was only true if this level occurred during a particular phase of the cell cycle. Adrienne’s final slides superbly demonstrated that the predictive modelling almost perfectly matched ATML1 expression levels. The modelling was performed in collaboration with the groups of Henrik Jonsson and James Locke at the Sainsbury Lab in Cambridge. Apr Schnittger (Univ. Hamburg, Germany) “Control of entry and progression through meiosis”. Arp focused on his lab’s work that uses precise microscopy to analyse the factors that control female gametophyte development. It was interesting to observe that many transcriptional regulators whose action has been described in other tissues (WUS, CDKA1 RBR, KRP )also have activity in this developmental program. John introduced the liverwort Marchantia to the angiosperm-focussed audience (see the recent special issue on Marchantia from PCP for an overview of this fascinating species). Marchantia is dioecious meaning that it has both male and female individuals, and even has an X and Y chromosome. This provides an interesting study system for the evolution of dioecy in higher plants, and the impact of dioecy on genome evolution. Finally, he showed nice work using CRISPR/Cas to knock out candidate Marchantia regulatory genes. We can expect lots of nice work to be coming out of this system. 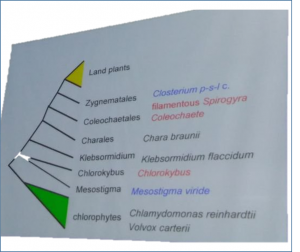 Tomoaki walked us through the lineages of early-diverging bryophytes including Jungermannia infusca, Haplomnium mnioides and Antehoceros agrestis, and discussed the implications of studying the genome sequence of these plants. Additional information about the evolution of land plants can be obtained from the genomes of green algae including Chara spp. Eric describes the story of a mystery uncovered by Martin Koornneef when he generated the first genetic map of Arabidopsis thaliana that reveals a chromosomal inversion that differentiate Columbia from Landsberg ecogypes. It turns out our reference ecotype Columbia is the one in which the inversion occurred (!). Interestingly, like in other studies, the inversion site is correlated with a transposon. This nice work is expected to be published soon. Olivier described the cool phenoscope facility and how it’s being used to look for natural variation in environmental responses. By the fine-structure analysis of how stresses affect growth rate you can gain insights into plant physiology as well – for example, the growth rate recovers to some extent after drought stress, but not after NaCl stress, showing how different these stresses are to a plant. He also showed a nice analysis of QTL strength over time, which is a good way to help you decide how relevant different QTLs are to the response you want to study. Enamul introduced the phytochrome signaling pathway to kick off the session (see Illuminating progress in phytochrome-mediated light signaling pathways) , and also described his recent paper in Nature Communications,CUL4 forms an E3 ligase with COP1 and SPA to promote light-induced degradation of PIF1, and in Plant Cell, A Negative Feedback Loop between PHYTOCHROME INTERACTING FACTORs and HECATE Proteins Fine-Tunes Photomorphogenesis in Arabidopsis. Giltsu Choi (KAIST, Korea) – How does PIF1 target specific sites in vivo? Akira described how his group has used microdissection to identify Spatial Regulation of the Gene Expression Response to Shade in Arabidopsis Seedlings – Nice work. Believe it or not, that only took us to the 3pm coffee break, but it’ll have to do for now! The second half of the day (we adjourned at 10PM) included sessions on development, chemical biology, stress, cell biology…. and a workshop to consider the future of Arabidopsis research – what do funding agencies need to hear to continue supporting our green supermodel? More on that later, tomorrow is another very full day!